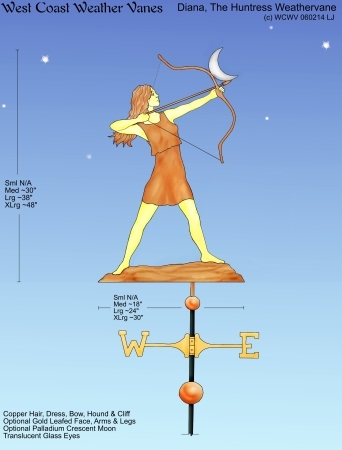 We are loving the design process for our Diana the Huntress Weathervanes. The designs are for a singer from Southern California, named Diana. So much of the business of music happens at night, it is lovely to be acknowledging an ancient figure regarded in many cultures as representing the moon and the night time huntress. Diana is also regarded as having a particularly charmed relationship with the animals, enhancing her persona as a benevolent hunter. 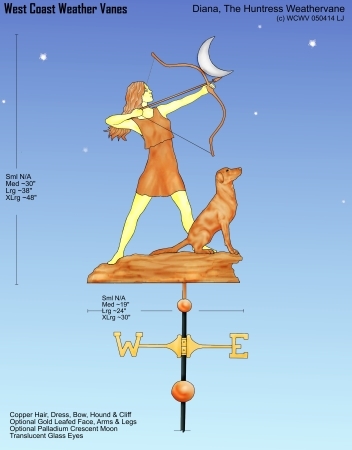 Our Diana with Dog design points to this characteristic in her legends. These designs are each in the swell bodied style, providing both depth and strength to the sculpture piece. The illustration is colored to represent our most popular option of gold leafing on the skin parts. We also show optional palladium leaf on the crescent moon. Both Diana and her dog have custom made glass eyes. This piece would be especially striking with night lighting, picking up the gold and palladium as it tracks the wind in the night sky.